Browsing in private mode can be really useful in a lot of situations. Maybe you just might want to check out the objective internet, avoiding the web pages and search results designed for you, according to your browsing and search history, and so on. Although the private mode of browsers is very useful, if you are using it too often, it might become a little bit tiring to open it up after you open the "normal" browser all the time. 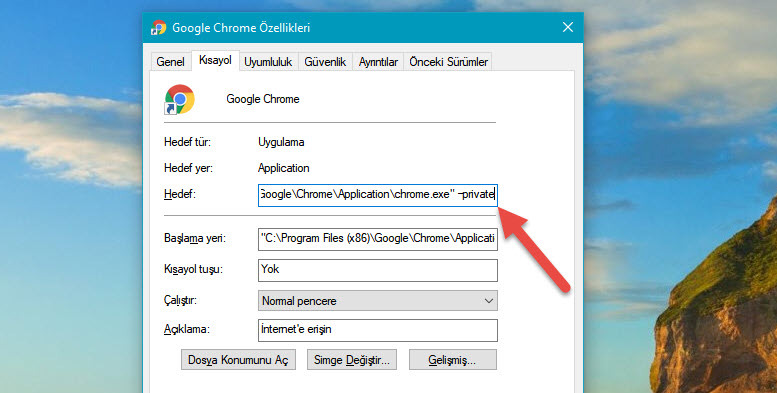 Unknown to most users, it is actually very easy to set most browsers open "private mode" by default. The easiest way to open your browser in private mode is to right click the browser icon on start menu (Windows 10, Chrome, Firefox, Safari, and Opera) and open a private tab from there. You can do this on taskbar icons as well. Mac users can right click the icon in the dock and click "new private window". Go to the hamburger menu, and then, "Options". Head to the Privacy tab under History, choose "Firefox will never remember history" from the menu. Don't forget to restart your browser so the changes can take effect. It is easy to set Safari to private mode too. 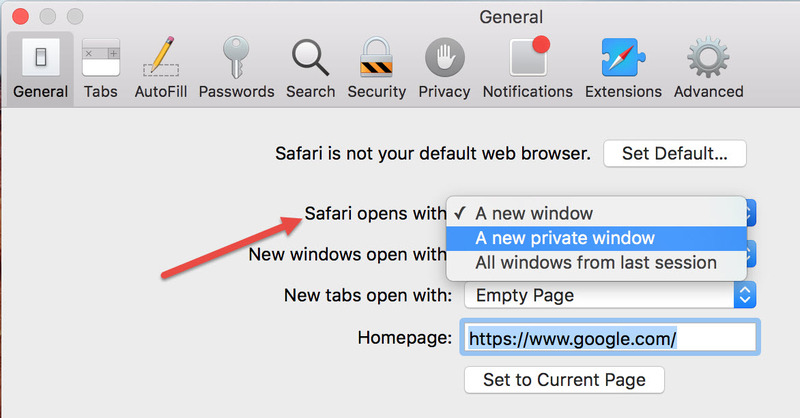 On the General tab and in the "Safari opens with" section, choose "A new private window" from the dropdown menu..
Again, you will have to restart the browser so the changes can take effect. Right click on the shortcut and bring up the context menu, go to Properties. In the "Target" section, you will have to add -incognito to the very end of the line. It should be after the last quotation mark, with one space in between. 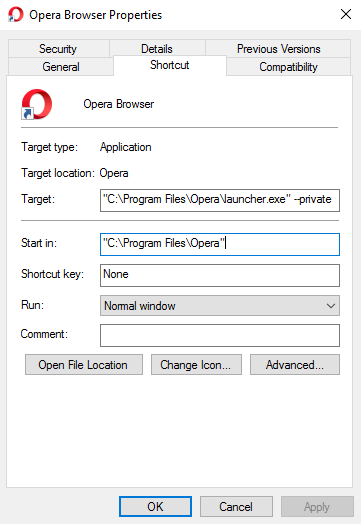 Setting Opera in private mode is the same with Chrome. Create an Opera shortcut somewhere, preferably your desktop. Right click on the shortcut, go to Properties. In the "Target" section, you will have to add -private to the very end of the line. It should be after the last quotation mark, with one space in between. There is no known way to set the Edge browser into private mode by default. You're going to have to open it manually all the time. For a completely private and anonymous browsing experience, you may want to try out the Tor browser. ←What is a keyboard shortcut?